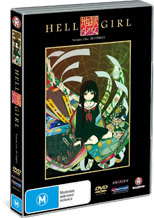 Hell Girl Volume 1 is the ultimate anime revenge experience that is Japanese horror at its best. Each episode features a "victim" and when they approach the mysterious "Hell Link" for assistance, a website that allows the user to enter in the name or names of their tormentors in order to extract supernatural vengeance, things begin to implode. However there is a price and when the name is entered, the victim is visited by Ai Enma, a strange school girl who offers them a covenant. Ai Enma has the ability to send their tormentors straight to hell, however when the victim dies so will their soul. The series also brings forth the issues that surround the mysterious Ai Enma and features some great supernatural themes littered through each episode. An interesting aspect of the human and supernatural psyche which I'm sure all anime lovers will simply adore and leave the question open to the viewer... would you except the covenant of Ai Enma?